Eat The Most Influential Tacos in L.A. 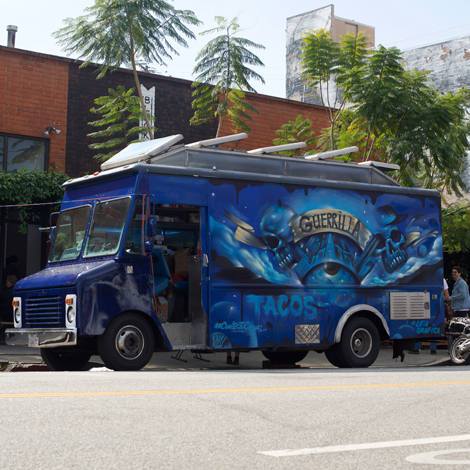 The Most Influential Tacos in L.A. Noted author Gustavo Arellano paints a portrait of the taqueros, taquerías, and institutions that make Los Angeles the spiritual home of the taco in the U.S. Welcome to L.A. Week 2016. To celebrate the rich culinary life of Los Angeles, we’ll be running special features all week that explore the city’s ever-evolving food scene—from its classic tacos, to its offbeat icons. Follow along on Twitter @firstwefeast. The big issue generating headlines in Tacolandia right now is San Antonio and Austin’s Breakfast Taco Wars, a campaign in which I was more than happy to deliver a howitzer against Austin in defense of the Alamo City. Breakfast tacos are delicious and deserve more coverage outside of the Lone Star State, so kudos to the two cities for bringing national attention to their taco culture. Meanwhile, Los Angeles laughs and laughs at these shenanigans. Because while Austin and San Antonio fight with each other over quien es más macho, the City of Angels stands alone and unquestioned in taco culture—not just as the American Bethlehem and Nazareth of the quintessential Mexican meal, but its pinche Garden of Eden. It’s where the taco first made its appearance in an American newspaper; where it received its first scholarly closeup; where tacos became commodified for mass consumption; where they became meals on-the-go for a new, multicultural America; and where continued migration of Mexicans will bring in more taco traditions sure to hit other parts of el Norte soon enough. To write about the 10 most influential tacos in Los Angeles is really to write about the tacos that created America—the dishes that taught gabachos how to love Mexican food, and whetted the appetite for more “authentic” versions to come. A quick note to my L.A. compadres—this is not my idea of the best tacos in your city, nor even the most popular, but rather the pioneers. Don’t like my choices? Don’t get mad at me—after all, I wrote the book on the subject, cabrones. Photos by Gabriel Carbajal, unless otherwise noted. Follow him @el_dragon_tragon. Why it’s influential: Modern-day visitors to Los Angeles won’t believe it, but the city was a Midwesterner’s paradise before World War II—indeed, the nearby port city of Long Beach had the nickname Iowa-by-the-Sea. And it was a Virgina housewife named Bertha Haffner Ginger who arrived to L.A. in 1912 and taught Anglo housewives how to make tacos as part of a cooking-class program for the Los Angeles Times (incidentally, the paper was also the first American publication to describe a taco, in an 1898 travelogue). “An announcement that my lesson for the day would be [Mexican] dishes,” she wrote in her 1914 cookbook, California Mexican-Spanish Cook Book, “invariably brought record-breaking crowds in any city in the United States.” Her manual has both the first documented recipe and photo for tacos in the U.S. If you find an earlier, undocumented taco, deport them my way, wontcha? Address and Phone: 23 Olvera St (213-687-4391) Website: cielitolindo.org Why it’s influential: Cielito Lindo unleashed the first taco trend in American history­: taquitos, the taco’s rolled-up younger cousin. Founder Aurora Guerrero brought over the dish from her native Zacatecas to a small stand in Olvera Street, a kitschy tourist trap created to make wealthy Anglos dream of Old Mexico, even as the city was gentrifying poor Mexicans out of downtown (the more things change...). Opened in 1932, Guerrero’s descendants still run the stand, still fry up daily thousands of crunchy, golden rods stuffed with beef barbacoa and slathered in an unctuous avocado salsa that every restaurant in Southern California and beyond tried to copy without success for decades afterwards. 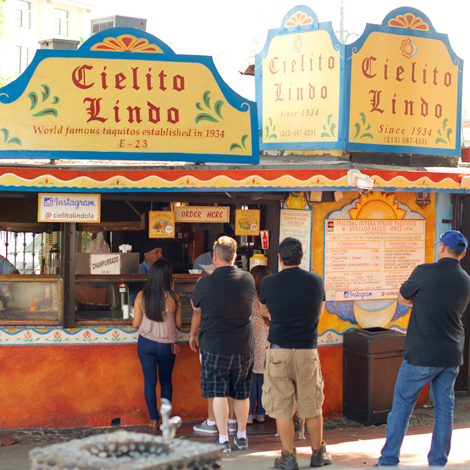 It’s not just a relic, either: Cielito Lindo remains a must-visit because its taquitos are muy bueno. Address and phone: 2803 W Broadway (now closed) Website: N/A Why it's influential: Ernie’s never served the best Mexican food, nor were its tacos necessarily revolutionary, nor was it even the first of its kind. But until it finally closed in 2014 after 70 years, it was Los Angeles’ ultimate taco house, a particularly Angeleno genre of restaurant that served as a bridge between street food and El Torito, and eventually paved the way for honest-to-goodness taquerías. The Cruz family also set a template by creating one of the first Mexican restaurant chains in the country (and also one of the first copycat places after the husband-and-wife team divorced; the husband kept the original name of Ernie’s, while the wife renamed one of the places she kept as Ernie Jr.’s). It was yet another step towards authenticity for gabachos, bringing them that much closer to the Taco Holy Land. Address and phone: 602 N Mount Vernon Ave, San Bernardino (909-888-0460) Website: N/A Why it’s influential: Like it or not, Glenn Bell was America’s most important taco evangelist thanks to his creation of Taco Bell, founded in 1962 in the Los Angeles suburb of Downey. But Bell got the idea of making hard-shell tacos for an American audience a decade earlier, when he operated a hamburger stand in the West Side barrio of San Bernardino, a city about an hour east of Los Angeles that was also the birthplace of McDonald’s. Bell’s business stood across the street from Mitla Cafe, and he’d close up shop every night and end with a dinner at Mitla, returning to his stand to try and figure out how to reverse-engineer the tacos. Eventually, the Mitla owners tired of his attempts at thievery and taught Bell how to make their tacos dorados, which they had brought over from Jalisco. 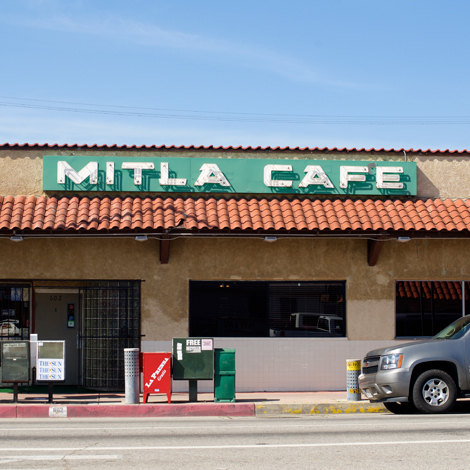 Mitla still stands today, now in its fifth generation of ownership (opened in 1937) and having never changed its tacos—living, breathing, crispy history. And, yes, pendejo bloggers: San Bernardino isn&apos;t technically Los Angeles, but respect your taco abuelitos! 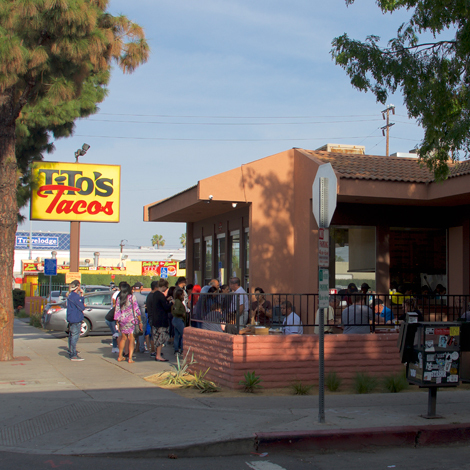 Address and phone number: 11222 Washington Pl (310-391-5780) Website: titostacos.com Why it&apos;s influential: Opened in 1959, Tito’s Taco is the spot that connoisseurs love to hate. Its cheese-laden ground-beef tacos represent everything wrong with hard-shell tacos—bland, dry, whatever. But generations of Angelenos swear by them (or Tito’s eternal enemy, Henry’s Tacos in Studio City, which sells the same crappy nostalgia), and the lines never end, showing that a market remains for Cal-Mex cuisine in Los Angeles, even in an age when regional Mexican dominates any serious food discussion. And it just so happens that the Tito’s jingle (“I love Tito&apos;s Tacos You love Tito&apos;s too. I love Tito&apos;s Tacos What else can you do?”) is the stuff of Southern California television infamy, on the same level of late-night TV host Wally George and preacher Gene Scott. Address and telephone: Various locations (800-KING-TACO) Website: kingtaco.com Why it’s influential: While food trucks have been a part of the Southern California landscape since before the invention of the combustible engine (horse-driven tamale wagons were L.A. obsessions as early as the 1880s), it took Mexican immigrant Raul Martinez to open the first lonchera devoted solely to making tacos. 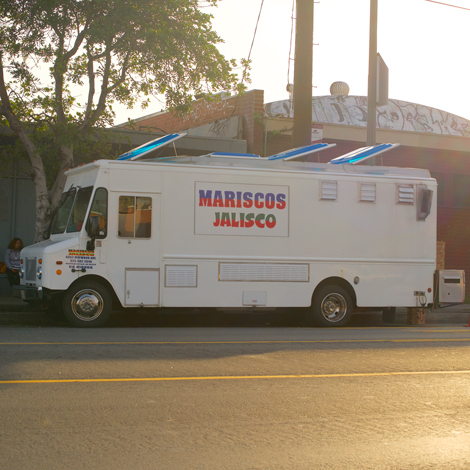 Converting an old ice-cream truck and parking it outside of a bar on Olympic Boulevard in East Los Angeles in 1974, Martinez seemed crazy—until lines started forming. 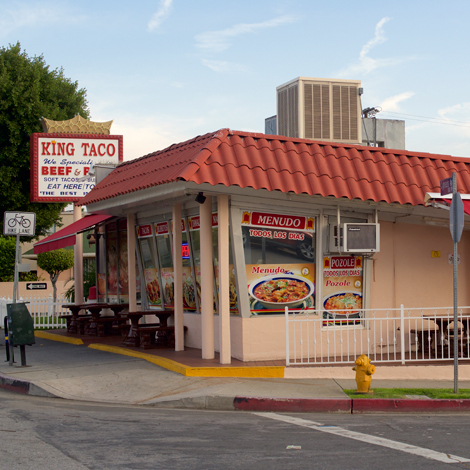 Today, King Taco is a Los Angeles landmark, but more than just creating the first taco truck, King Taco also signaled a fundamental change in taco culture: It eschewed the hard shell for what Anglos originally called “soft” tacos, but now everyone just calls tacos (that is, tacos made from a heated corn tortilla). 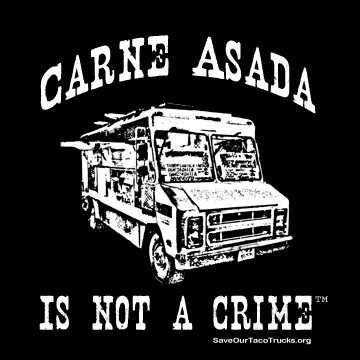 Martinez also moved tacos away from shredded and ground beef into the cuts—carnitas, al pastor, carne asada, chicken, etc.—that we know today. Unfortunately, the original King Taco Truck was lost in a fire long ago—not even a hubcap was saved. 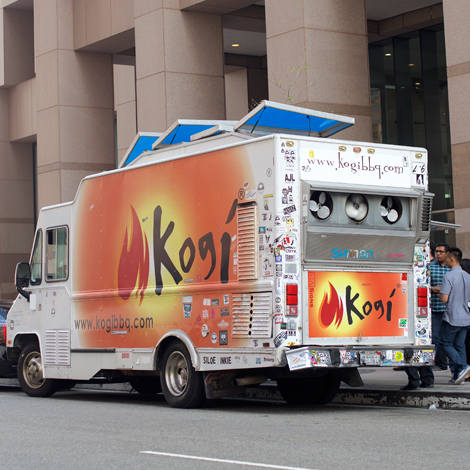 Address and phone: Multiple trucks Website: kogibbq.com Why it’s influential: Roy Choi is now food royalty, and increasingly a major player in thought-leader circles with his recently launched Locol. No one could’ve ever guessed that trajectory when he and his partners opened the Kogi BBQ truck for business in the fall of 2008. Asian-American college students had been putting Korean barbecue in tortillas and calling it a meal since the 1990s, and the legendary Oki Dog essentially created the Asian-Mexican burrito. But Kogi hit at the perfect time, when the confluence of social media, hungry eaters, and a faltering economy created the non-Mexican food-truck movement (proponents call them gourmet trucks; I call them luxe loncheras). Every modern-day truck, every attempt at fusion, ever social-media trick owes a debt to Choi and his squad. 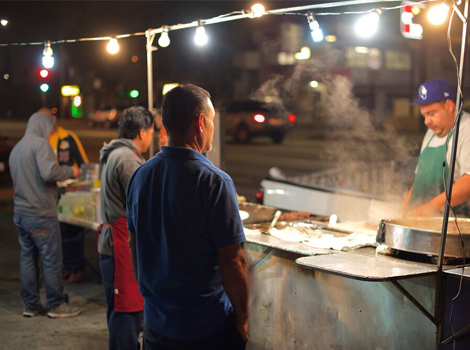 Address and phone: 3040 E Olympic Blvd (323-528-6701) Website: N/A Why it’s influential: Just as loncheros were in danger of losing their luster in the face of the Food Truck New Wave, Mariscos Jalisco staked out a spot for tradition by embracing the hyper-regionalism that’s continues to be the biggest food trend in Mexican cooking in the United States. Owner Raul Ortega’s taco dorado de camarón (deep-fried shrimp taco bathed in a salsa and topped with avocado) comes from San Juan de Los Lagos in the state of Jalisco, a region heretofore ignored in regional Mexican foodways despite having similar influence to Oaxaca, Veracruz, and Mexico City. But through the efforts of my compadre, renowned tacorrazo Bill Esparza, Mariscos Jaliscos began drawing in non-Mexicans. Soon, those foodies began seeking out operations with more hyper-regional cuisine, and loncheros and restaurateurs responded in kind by copying Mariscos’ shrimp taco. They also felt confident enough to unleash an avalanche of regional tacos like beso de monja (al pastor on a flour tortilla) from Cuernavaca, chavidencas (a type of quesadilla from Michoacán), and many more—with Angelenos hashtagging every moment of it. Address and phone: Multiple locations (323-388-5340) Website: guerrillatacos.com Why it’s influential: Chef Wes Ávila is part of a new wave of Mexican-American chefs that are defining the future of tacos in the United States and beyond: proud of their raza roots, but raised in the United States and classically trained, resulting in tacos that simultaneously sing of Tenochtitlán, a 1am run after a concert, and a white-tablecloth meal. More importantly, Ávila represents an opportunity to get Mexican-Americans talked about in the same breath as the Haffner Gingers, Bells, and Chois of the past. A Mexican creating a revolutionary taco—impossible!